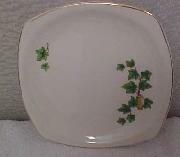 more from Paden City Pottery Co.
Paden City Potter Ivy (Minion.Gold trim) Minion Shape, Ivy in Vase.. Square Bread and butter plate 6 1/4" by 6 1/4" have wear to the gold trim. No chips or cracks. in good used condition..
PRICE: $4.99 plus $1.50 special handling charge.